Note: This review pertains to the Redragon K552 LED keyboard. Redragon also offers the K552 without the back-lighting or with additional multi-colored RGB lights. The board we purchased and examined only had the color red for lighting, but it was adjustable for a heavy red or a more subtle touch of color. Redragon has made some pretty notable accessories in the past, and while they aren’t mainstream in popularity with the likes of SteelSeries or even Razer, they do compete fiercely in price and value. I find that a lot of their products are very well-made and aren’t just cheap knock-off items. They actually perform true to form and also save me a few bucks as well. I have tried a few mechanical keyboards in the past, but I haven’t really written a review for one. I know what a mechanical keyboard should feel like and what kinds of features I personally like, but for a budget mechanical keyboard such as the K552 Kumara, expectations can’t be sky-high. Let’s start off with build quality, since one of the main points of buying a mechanical keyboard over a traditional one is to tap away with pressure and still maintain its structure. 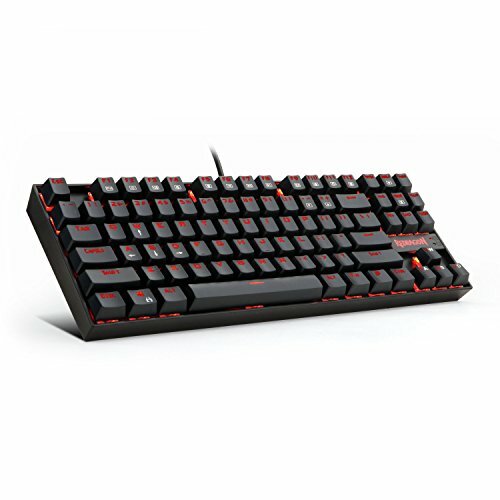 Redragon advertises this keyboard in particular as having a heavy duty metal frame, quality caps for the individual keys, and long-lasting springs underneath each of them. While I won’t take apart the keys to see what kind of material is used for the springs, I can report that the keys seem sturdy enough to last a while. Nothing about the entire board raises a red flag to me that says it will wear down within a few months, like some other cheap mechanical keyboards I have tried in the past. The material making up the base is impressive considering the price. The K552 doesn’t feel like cheap plastic unlike other keyboards in the price range. It’s not metal by any means, which was in fact disappointing, but the hard plastic almost gives off a premium vibe to it that is very enjoyable from my point of view. A side note for potential purchasers, though: this is ten key-less. It does not have a number pad, which can be beneficial or take away from the experience depending on what you want. If you prefer a more compact keyboard, definitely consider it. Time was actually put into the product that I was very happy with. Believe it or not, one of my longtime friends over at another gaming site purchased a dirt-cheap mechanical backlit keyboard on eBay. It advertised itself as “backlit” but when he got it, the letters were just painted on instead of actually lit up. Purchasers unfamiliar with the Redragon name may be quick to dust the product off as one of these cheap ones off eBay, but trust us when we say the stuff they make are legit. The build quality on the keyboard is enough for a purchase, as it really feels premium. Yes, while it may seem obsessive, backlighting is indeed important when looking for a keyboard, particularly for gaming. Matching the desktop you are proud to own with its accessories is just another hobby we PC gamers have, and a well-backlit keyboard only adds to that by giving a nice accent to the entire piece. If you don’t care about lighting or design, I’d still highly recommend the Redragon K552 keyboard, only get the non-lit option when purchasing. For this Redragon K552 review, I mentioned I am only doing the regular red lighting. This review does not pertain to the K552 keyboard with RGB lighting, which offers additional colors. Instead, the keyboard we purchased only had the option to light up one color: red. Even though we only have one color to choose from, we do have the option to change its intensity. I personally only go for a small hint of red, but Redragon also offers the option to go full red hue, which in my opinion overloads the keyboard and makes it look messy. Also, if it’s too bright, I find that it distracts from your focus of the monitor right in front of you. Regardless, the choice is yours. Red is still a very beautiful color that matches well with the signature Redragon black-and-red color scheme. For those trying out a mechanical keyboard for the first time, I’d say that the Kumara is probably the best entry. It is only roughly $30 to $40, depending on where you buy the K552 online — we got ours for around $38 after taxes. This is a very well-done actual mechanical keyboard with the real refinement, feel, and sound of a mechanical keyboard. The keys feel pretty high quality and the resistance is spot-on in the middle. A little side note for new mechanical keyboard users: mechanical keyboards have springs underneath the keys that ever slightly resist your touch. They are known to make loud clacking noises when typing. I personally don’t mind the sound, it is actually soothing in a way, but for those perhaps living in an apartment with close neighbors or otherwise in an environment where clacking sounds from a keyboard will disturb others, I would highly recommend any other classic keyboards. The keyboard in its entirety is definitely worth it. The build quality alone is pretty impressive, not made with cheap plastic by any means. The keys and the base seem sturdy. The lighting, at least on this model, leaves a little to be desired, but for a mechanical keyboard that costs under $50, it truly isn’t something to complain about. Again, this is the perfect keyboard to test if mechanical is the way for you. It has all the makings of a durable and functional mechanical keyboard. The only thing is, because of the price point, you won’t get some of the great (though optional) features that others in the higher tiers bring to the table.